The Dodge Avenger is a front-wheel drive, mid-sized sedan that was built by Dodge. The Dodge Avenger made its North American debut in 1994 as a two-door coupe, which was produced until 2000. It was re-introduced to the market as a four-door sports sedan starting in 2008. The 2014 model year marked the last production for the Avenger, as models for both the Dodge and Chrysler brands were consolidated into the single 2015 Chrysler 200 model,. while Dodge received the compact Dart based on the same platform. The Avenger was built on a 103.7 in (2,634 mm) wheelbase and used either a 2.0 L inline-four engine (the Chrysler 420A) or a Mitsubishi-designed 2.5 L V6. The four-cylinder was coupled to either a five-speed manual transmission, shared with the Mitsubishi Eclipse and Eagle Talon, or a four-speed automatic. The V6 engine was only available with the A604 automatic transmission. The Avengers featured a fully independent double wishbone suspension and variable speed rack and pinion steering. MY 1995 Initial introduction - replaces the Daytona. A DOHC 16-valve 2.0 L I4 engine (140 hp, 130 lb⋅ft (176 N⋅m) of torque) is standard. A SOHC 24-valve 2.5 L V6 engine and an automatic transmission (155 hp, 160 lb⋅ft (217 N⋅m) of torque) are made optional on the ES. Fog lamps and ABS are also optional on the ES. 1996 Power and torque ratings for the V6 are increased (163 horsepower, 170 lb⋅ft (230 N⋅m). torque), ES Coupes had new seat fabric. Never a high selling vehicle, in 2000 the Avenger was discontinued and replaced by the Dodge Stratus coupe for 2001. 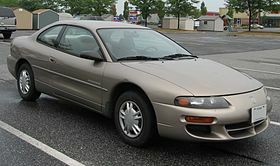 This model was also made at the former Diamond Star plant by Mitsubishi, using the Eclipse platform and architecture, though the Stratus sedan was engineered and built by Chrysler. In the US, the Avenger was launched with a 30-second television ad, "Tuned Up," that debuted Sunday, March 4, 2007 during NHL hockey, an ad in which a lab technician discovers he can play Smoke on the Water by Deep Purple on the Avenger's transmission. Another television spot likened the Avenger to the "superhero" vehicle for the everyman, depicting a driver piloting his Avenger through Gotham-like streets and alleys, speaking to the MyGig entertainment system in distinctly Batman-reminiscent tones, to arrive home, pull into a two-car garage and open the rear door to a sleeping child in the rear car-seat. Mechanically, the 2011 Avenger came standard with the existing 173 hp (129 kW) 2.4 L GEMA I4, although it was now paired with a six-speed automatic, as well as the option of the previous four-speed. Also available was the new 3.6 L Pentastar V6, which generates 283 hp (211 kW) and 260 pound force-feet (350 N⋅m) of torque. The suspension was revised to improve handling and ride quality. Trim level designations were replaced by Express, Mainstreet, Lux, and Heat models. SXT Plus: (2012) One of the more "uplevel" trim levels in 2012. Discontinued after 2012. The 2008 to 2013 Avenger, also sold as the Chrysler Sebring from 2008 to 2010, and the Chrysler 200 from 2011 to 2013, receives an overall "Good" rating with no significant injuries. In the small overlap test, also conducted by the IIHS, the car received an overall "Acceptable" rating, due to marginal dummy kinematics and slight intrusion into the passenger compartment. In the side test, the Avenger earns a "Good" rating, however, rib fractures would be possible for the driver. In the roof strength evaluation, it earns a "Good" rating, as well as its head restraints and seats. The Avenger earned the "Top Safety Pick" award in 2010, 2011, 2012, 2014, and earned the "Top Safety Pick+" award for 2013. The discontinuation of the Dodge Avenger was announced by the automaker in early 2014, along with the end of the Chrysler 200 convertible model. The final 2014 model year Avengers were produced during first quarter 2014. The first-generation Dodge Avenger body style was widely used in the National Hot Rod Association, but came to the most prominence being driven by Darrell Alderman, and Scott Geoffrion, during their run from 1994–2000, as the celebrated Dodge Boys. The car was also used for the 1994 and 1995 incarnations of the International Race of Champions. Avenger sheet metal was also used on race cars by several ARCA race teams from 1995 to 2000. ^ Debertin, David. "Chrysler Sebring and Dodge Avenger coupes: Mitsubishi Mopars". Allpar. Retrieved 7 April 2015. ^ Wernle, Bradford (January 17, 2007). "New Dodge costs less than outgoing model". Autoweek. Retrieved July 11, 2014. ^ a b "2008-2014 Dodge Avenger cars". AllPar. Retrieved July 11, 2014. ^ "2008 Dodge Avenger". CarGurus.com. Retrieved 2008-06-29. ^ "2008 Dodge Avenger Launches Marketing Campaign". Carbuyersnotebook.com. 2 March 2007. Archived from the original on 2 October 2008. Retrieved 7 April 2015. ^ a b Kong, Benson (October 28, 2010). "First Look: 2011 Dodge Avenger". Motor Trend. Retrieved 7 April 2015. ^ "Full 2011 Dodge Avenger Review". Edmunds. Retrieved 7 April 2015. ^ "New Auto Index Redefines "American Made" Cars". Kogod School of Business, The American University. May 2013. Archived from the original on 2013-04-03. Retrieved 7 April 2015. ^ "2014 Dodge Avenger Review". US News & World Report. Retrieved 7 April 2015. ^ "Dodge Avenger Sales Figures". goodcarbadcar.net. 2011-01-01. Retrieved 2014-11-11. ^ "December 2008 Sales: Chrysler LLC". CheersandGears.com. 2009-01-05. Retrieved 2009-01-05. ^ "AMDA Mex (Industria Automotriz 2008-2013.pdf)" (PDF). Archived from the original (PDF) on 2016-01-20. Retrieved 2017-07-07. ^ "Chrysler Group LLC December 2009 Sales". CheersandGears.com. 2010-01-05. Retrieved 2010-01-05. ^ "Chrysler Group LLC December 2010 Sales". CheersandGears.com. 2011-01-04. Retrieved 2011-01-04. ^ "Chrysler sales shoot up 37% (26% for 2011)". allpar.com. Archived from the original on 2012-01-10. Retrieved 2012-01-04. ^ "Chrysler Group LLC Reports December 2012 U.S. Sales Increased 10 Percent" (Press release). Chrysler Group LLC. 2013-01-03. Retrieved 2013-01-04. ^ "FCA US LLC Reports December 2014 U.S. Sales Increased 20 Percent - Best December Sales in a Decade; Full-Year Sales Up 16 Percent - Strongest Annual Sales Since 2006" (Press release). PRNewswire. 5 January 2015. Retrieved 7 April 2015. ^ Joseph, Noah (23 February 2014). "Chrysler killing off 200 Convertible, Dodge Avenger". Autoblog.com. Retrieved 7 April 2015. ^ Mihalascu, Dan (24 February 2014). "2015 Chrysler 200 Won't Get Convertible Model; Dodge Avenger Will Be Axed as Well". Carscoops.com. Retrieved 7 April 2015. Wikimedia Commons has media related to Dodge Avenger.